Commemorative footballs stored in clear plastic cases sit atop a cabinet in the office of Totino-Grace football coach Jeff Ferguson – and he is rightfully proud of each one. With six state championships in the past eight seasons, the Eagles' dynasty is unquestioned. All six titles came in Class 4A, the second-largest of Minnesota's six football classes, leaving skeptics to wonder whether Totino-Grace, a private school located in Fridley that draws students from surrounding suburbs, should have "opted up" to play in Class 5A. Other high-profile programs in various sports – particularly boys' hockey – have faced similar criticism over the years, sparking lively debates and occasional hard feelings. The question of whether to opt up is even more relevant now in light of a recent Minnesota State High School League policy change. The MSHSL uses a school's enrollment to determine its classification for postseason tournaments, and individual programs at schools have the option of playing at a level above what the enrollment dictates. But it used to be a four-year commitment for teams opting up; a policy change sliced that number to two years beginning with next school year, giving top-notch smaller programs a chance to dip their toes in the water to see if they belong with bigger schools rather than having to dive in for a long-term commitment. "It's complicated," Ferguson said. "I want to do what's perceived as right but I also want to do what's right for our school and our kids. It's a multifaceted decision, and it's not just about championships." MSHSL Executive Director Dave Stead said the policy change is primarily designed to work in the other direction. Some schools, mostly in Minneapolis and St. Paul, are allowed to opt down in certain sports because they meet various criteria. "And as an aside, we thought maybe some schools would choose to opt up in a two-year cycle where they might not have in a four-year cycle," Stead said. Currently, 71 programs from 51 schools opt up. The most significant examples come in boys' hockey, with competitive non-metro programs such as Duluth East and Roseau and metro-area private schools Benilde-St. Margaret's, Cretin-Derham Hall, Hill-Murray and Holy Angels all playing Class 2A hockey despite 1A enrollments. Another metro private school soon might be joining that list. 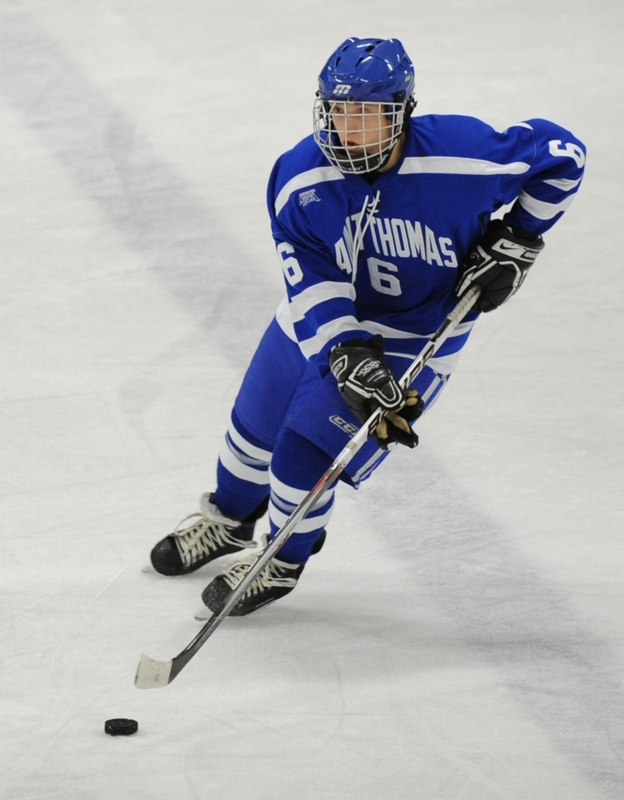 St. Thomas Academy activities director Jack Zahr said the school is in "serious discussions" about whether its successful boys' hockey program will opt up to Class 2A beginning next season, though Zahr said the discussions are not directly tied to the MSHSL's new timetable. Critics say the move is a long time coming. The Cadets' recent success (Class 1A boys' hockey titles in 2006 and 2008) has made them a target in hockey circles. "We get chirped [at] a lot about being No. 1 most of the time in Class 1A," said senior forward Zach Schroeder, who recently committed to RPI. "You hear a lot about how we're playing for a JV championship." Added senior forward A.J. Reid: "Everyone says we're soft because we play at the Class 1A level." Both players would have welcomed a move to Class 2A during their careers, even though the Cadets have missed the past two Class 1A tournaments, proving there is no sure thing at any level in hockey. "I definitely think we're in the mix," Schroeder said. "We stay right with teams like Minnetonka and Hill-Murray [during regular-season games] and we have a good chance of winning depending on how we play that night." Ferguson said "we would have jumped at" opting up during Totino-Grace's rise five or six years ago if the commitment were two years. But declining enrollment presents a challenging outlook in football, the ultimate numbers game. Currently, 20 football programs opt up, all of them from 9-man to 1A, the second-smallest class. Earlier in its championship run, Totino-Grace graduated classes of roughly 275 students. Ferguson said there are approximately 160 students in the current freshman class and he is cautious of opting up for the next two seasons just to appease the court of public opinion. "We had about 1,100 students a few years ago and we have less than 800 now," Ferguson said. The enrollment range for Class 4A football teams is 623 to 1,245 students. "And we'll probably have less than that next year. We don't want to be trophy chasers, but we have to look at what's realistic." Back in 2005, Minnewaska girls' golf coach Peggy Falk pondered moving her promising squad up from 1A to 2A – and later from 2A to 3A when an additional class was added – to compete against the state's largest schools. She resisted in part because four years seemed like too lengthy of a commitment. The Lakers went on to become the first program to win five consecutive team titles and carded the lowest score of any state champion each time. "The shorter commitment does seem more enticing, especially for teams that you know will have successful back-to-back years," Falk said. "We didn't want to look cocky by going up for a while because we knew we'd have to come back eventually." An opposite dynamic exists for Simley's wrestling program. The school, located in Inver Grove Heights, won four big-school wrestling state titles in six seasons from 1987 to 1992, but declining enrollment dropped the program to Class 2A three seasons ago. The squad promptly won three consecutive 2A titles. With 32 kids out for wrestling this season, co-head coach and activities director Will Short said the Spartans are "not a huge squad." And though five Spartans are currently ranked No. 1 at their respective weights by The Guillotine wrestling publication, Short doesn't want to "make a decision for the whole program [based] on those five or six kids who you can get competitive matches for at tournaments." As such, he said there is little incentive to opt up into Class 3A regardless the time commitment. Getting placed in the same section as perennial powers Apple Valley (14 big-school championships in the past 17 seasons) and Hastings is his chief concern. "Do I fear wrestling Apple Valley at the state tournament?" Short said. "No. Do I fear wrestling Apple Valley or Hastings in sections and have a bunch of kids from those teams stay home? Yeah, I do fear that. That's the No. 1 thing stopping us. We would be crazy to go into that." Short's final sentiment on opting up is one that successful programs in lower classes across all sports have to wrestle with, regardless of the new time commitment: "If you didn't have to," he wondered, "why would you?"